It was time to be getting more of those seedlings out of the greenhouse and planted out in the fresh air this last week and so Wendy and I set too clearing any weeds that had appeared over recent weeks in the veg patch. Merrily busying away we were when I heard a shriek from Wendy, but do you know, I wasn’t quite sure wether it was a shriek of delight or fright. Initially I shouted over and then quickly made my way across to where she was to find out what the problem was and as I got closer I needed no explanation. Do you remember a couple of weeks ago, I mentioned that our resident rabbits had made a hole right up into the middle of the greenhouse, well that isn’t the only place they had excavated. Wendy had been digging away when she started to push the spade into the ground, when it gave way and caved in, in front of her. She then found herself looking down in amazement at 7 sets of eyes all peering up at her from this newly opened hole. 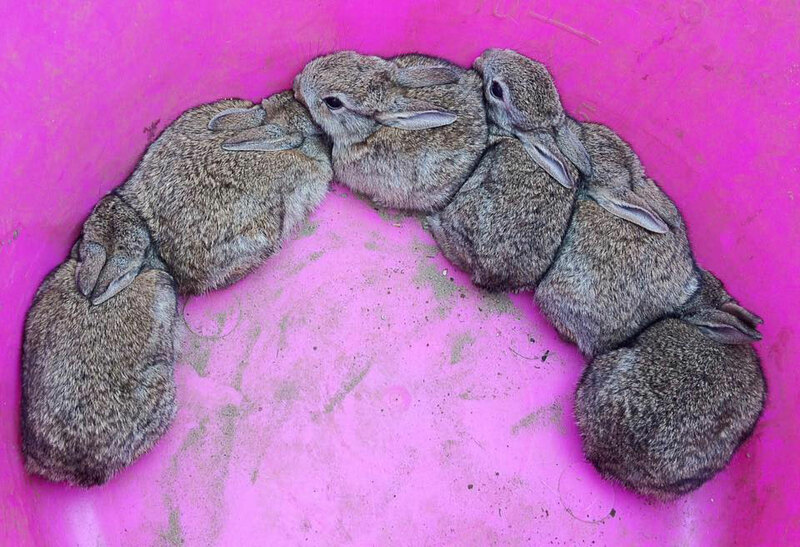 What she had found was a rabbit burrow full of young rabbits. By the size of them, these young rabbits were clearly old enough to be starting to fend for themselves, but what were we to do now. They were all huddled together, hoping that somehow what was going on was just a dream, but it wasn’t. One of them made a break for freedom and disappeared through the netting which surrounded the soon to be sweetcorn patch, but the other six just sat quietly. We couldn’t just leave them open to the elements and so whilst we thought about what to do we lifted each of them one by one safely into a large container. We did a bit of further excavation and found that there was a separate tunnel which ran up alongside this now open burrow and so we thought it best that we carefully put each of the young bunnies down this tunnel and hope that all would end well as a result. We set things up afterwards, with some netting over the hole, so they could come and go as they wished and in the few days following, we have seen fresh footprints each day, so we think that all is well in this part of rabbit land. Well, I’d been chasing around all morning, for a good three hours anyway and had just sat down to my cornflakes. It was a lovely sunny day and so the farmhouse door was open to let the dogs wander in and out and to let the sounds of the garden into the kitchen too. That was when, literally out of the blue, my peace was shattered. In through the door they came, twittering away to each other as they flew round and around the kitchen. Scout, our oldest, but laziest dog just glanced up from his bed, totally unimpressed that he had been awaked by all this bird talk in the kitchen. My breakfast time had been invaded by a couple of swallows, who appeared to be in no rush to leave, but eventually one did and the other attempted to, but took the wrong turn and crashed into the window thinking it was the best way home…it wasn’t. I picked up the dazed little fella, dusted him down and soon enough he was on his way, soaring through the skies with his mate and I could once again get on with my cornflakes in peace and quiet.